Published: Dec. 4, 2016 at 11:43 p.m.
With the calendar turning to December, scrounging the waiver-wire for viable options leaves me feeling like the scene from "Spaceballs," combing the desert with a hair pick. In other words, I'm pretty much coming up empty. That being said, here are 12 players to consider adding off waivers heading into Week 14. Some are high-upside stashes, others could provide immediate lineup aid. I've gotten rid of the free agent budget acquisition recommendations because at this point most FAAB budgets are exhausted. For those in need of even deeper picks/stashes, check here tomorrow for my weekly "Deep Dive." Dixon is clearly the No. 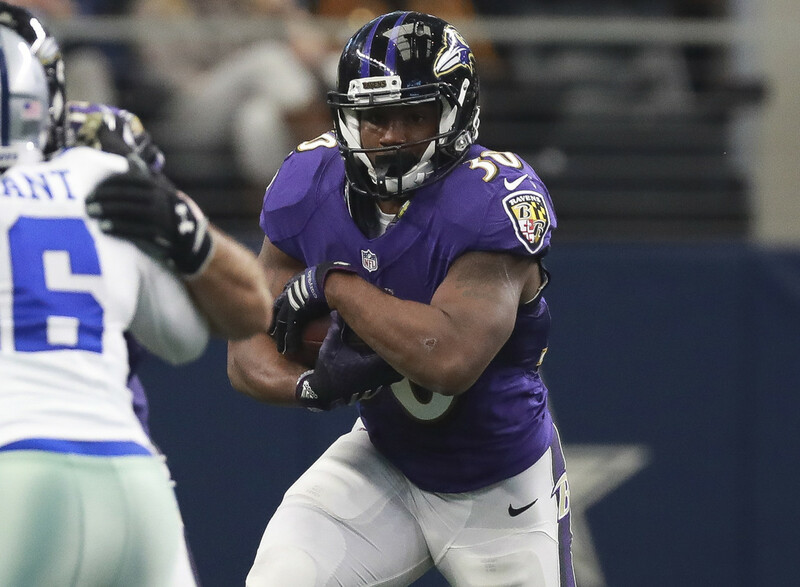 2 option behind Terrance West in Baltimore still, but not by much. Dixon saw 42 percent of the backfield opportunities come his way in Week 13, even though he played on just 33 percent of the snaps to West's 51. Dixon isn't really a viable play outside of deeper PPR leagues, but he's a strong stash candidate for the playoffs. While Burkhead didn't out-snap Hill again (he did so in Week 12), he outgained him 66 to 45 on 13 fewer touches. The Bengals need more production out of their backfield, and Burkhead could be the answer. He'll be a low-end flex next week against the Browns, but his arrow should be on the rise. Williams is purely an upside stash for the playoffs. He offers absolutely nothing unless Le'Veon Bell suffers an injury. Still, players with Williams' upside should be filling up fantasy benches for the postseason instead of rotational players who will never see the field enough to make it into starting lineups. Adding Morris stems from the same logic as adding Williams. In the event Ezekiel Elliott suffers any sort of injury, Morris would assume a massive workload and would hold at least RB2 weekly value. It can pay to have players like Morris waiting in the wings as opposed to trying to win them in a waiver-frenzy. Mitchell rose to prominence in the fantasy community over the last two weeks thanks to increased opportunities due to injuries. With Rob Gronkowski on injured reserve, Mitchell is in line for a much bigger role as we saw on Sunday. He played 84 percent of the Patriots offensive snaps and saw 10 targets against the Rams, catching eight for 82 yards. This rookie's arrow is firmly pointing up, especially with Danny Amendola suffering an ankle injury. The Chargers fell into a weird game against the Buccaneers, with Philip Rivers only throwing 26 passes, the second-fewest he's thrown in a game this season. However, Inman remains a prominent part of this passing attack as this marked his sixth-straight game with 40-plus yards, and his second-straight game with a touchdown. He's seen just shy of 19 percent of the passing targets since Week 7, with the five he saw on Sunday marking his lowest total in that span. The Chargers face the Panthers next week, which presents another solid matchup for Inman. Over the last three weeks (since A.J. Green suffered a torn hamstring), LaFell and Boyd have posted near identical stat lines. LaFell sits with 12 catches, 165 yards and a touchdown on 25 targets, while Boyd has 15 catches, 182 yards and a touchdown on 23 targets. The Bengals get the Browns next week, so both Cincy wideouts will be low-end flex/WR3 options in a game the Bengals should take control of early. Since returning from IR in Week 10, Green was playing sparingly, but constantly running routes and seeing targets when on the field. Case in point, he saw nine targets in Weeks 10-12, despite playing just 34 snaps. However, Week 13 was Green's coming out party, as he played 34 snaps and saw 11 targets, hauling in six for 110 yards and a touchdown. This was the Green the team envisioned having when they signed him as a free agent this offseason, and this is the Green fantasy owners should expect to see utilized moving forward. While we shouldn't expect 110 and a touch on a weekly basis, an expanding role in a high-flying passing attack makes for a great waiver-wire target right before the fantasy playoffs. Speaking of the fantasy playoffs, Brate has a tremendous schedule on the horizon that features two dates with the New Orleans Saints sandwiched around a matchup with the Cowboys, who have allowed the second-most receiving yards to tight ends heading into Week 14. Luke Stocker suffered an injury in the team's win over the Chargers, which could increase Brate's playing time as well. As one of the primary red-zone threats on a strong offense heading into three prime matchups, Brate could be a season-winning waiver pickup at fantasy's most frustrating position. Jordan Reed is battling an AC joint sprain that could keep him out multiple weeks, leaving Davis as the team's top tight end. The veteran posted five catches for 47 yards in the team's loss to the Cardinals on Sunday, with most of that coming in the fourth quarter. If Reed remains out next week when the Redskins head to Philadelphia, Davis will be a low-end starting option, but faces another brutal matchup. With Colin Kaepernick getting pulled for Blaine Gabbert in Week 13, it'll be tough to trust him when the fantasy playoffs begin next week. As a result, those searching for a streamer might need to hope for a little magic. A little Fitzmagic, that is. Assuming he remains the starter for Week 14, he'll be in a great spot to post fantasy totals against a 49ers defense that can't stop anybody. It's dicey, and if you have a primary starter you should roll with them. But those in a tough spot could give Fitzpatrick a look.